Would you believe that over 50% of all people who come to a party in your home will actually snoop inside your medicine cabinet?! …But only 4% are ever caught. Sometimes, Maybe You SHOULD Snoop! Here is one case in point. I can remember doing it once (now I don’t remember who’s house or why), but I certainly don’t make a habit of doing so. All in all, it seems like a rather harmless activity to take a peek inside someone else’s medicine cabinet. And, one thing’s for sure… if you do, you’re certainly not alone! 1. A Medicine Cabinet Slideshow featuring the contents of 14 (and counting!) peoples’ medicine cabinets! 2. A one-of-a-kind art gallery that features only photographs of medicine cabinets. 3. Okay, so that one’s not so “one-of-a-kind” after all… Here’s another one. 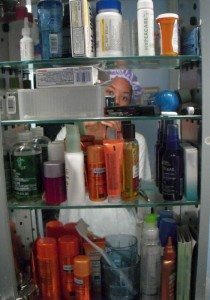 This gallery of medicine cabinets is called “Shelf Life”. If nothing else, perhaps today’s post will give you a little motivation to clean out your own medicine cabinet. If you’re anything like me, then you probably haven’t been in there in months… so it’s hard telling what you might find. …Here’s to snoop-proofing the medicine cabinets of America! Here’s a place to download lots of Seinfeld episodes, including “The Conversion” from Season 5.